Easy access to shopping and popular local sites plus comfy accommodations provide a convenient stay off Highway 45 for our guests at the Econo Lodge Tupelo. This two-story Econo Lodge has 60 rooms are accessible via exterior corridors and include complimentary local calls cable TV with premium movie channels and pillowtop mattresses. Premium rooms provide microwaves refrigerators and coffeemakers. Guests have access to an internet kiosk in the lobby as well as a fitness center. Parking is on the house. 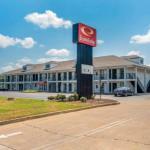 This Econo Lodge is located four miles north of downtown Tupelo and exciting events at BancorpSouth Arena. Located one mile off Highway 45 and I-22 guests are within five miles of the shops at The Mall at Barnes Crossing and less than two miles from Natchez Trace Parkway. Tupelo Regional Airport is six miles away.